"Am I really that troublesome?" 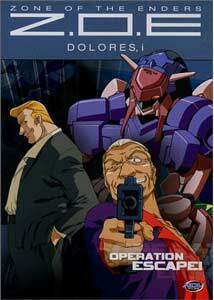 The saga of the Links family continues here in disc 2 of the I, Dolores anime, part of the Zone of the Enders storyline based, in part, on the popular video game series. Starting up right after the events on disc 1, James Links is desperately trying to rescue his son and daughter from the clutches of authorities who are trying to make them give up the location of Dolores, the giant orbital frame robot with the mind of a teenage girl. James and Dolores manage to briefly make progress and thwart the efforts of the Earth police, but the problem now lies with the fact that another, more mysterious organization is seeking them out with far more advanced robot technology. James, his kids, and Dolores are forced to travel out to a distant Earth colony in the midst of an asteroid field. Unfortunately, space mafia controls most of the colonies in deep space, so now they're forced to contend with a whole new set of problems. The core of this second volume is based around James trying to gain access to a space catapult that will launch his ship and Dolores towards Mars, which is their ultimate goal. In the process, their run-in with the mob complicates things, especially when they inadvertently trigger an internal war in the mafia factions. On top of everything else, there's also the issue of whether or not James' "Ender" craft has enough fuel for the trip to Mars. The family bonds are continually tested here, and that seems to be the ongoing theme of I, Dolores: a focus on the people, rather than just excuses for sci-fi action, although there's plenty of that to boot. Perhaps the most important evolution for the show in these episodes is a final, more concrete link between this series and Idola, the single-episode beginning to the entire Z.O.E. story, set many years before I, Dolores. Now, we see exactly how the Links family's story is intertwined with the destruction of the Deimos base back in that slightly older time. Is there a connection between that Orbital Frame and Dolores? Did James' wife actually have a hand in making both robots? These are the underlying mysteries to the series that have yet to be fully explored. Continually impressive is the balance between lighthearted comedy, serious drama, and space adventure this series maintains. While it is nowhere near as deep and serious as the predecessor, Idola, the show definitely brings you into it by making such vivid characters, whether it's James' dysfunctional, fully-grown kids, or the insane Earth police commander whose obsession with capturing James reaches ridiculous proportions. Dolores herself is also expanded upon quite a bit. While she was cute and in-the-way on disc one, her relationship with James and the others is deepened a bit. In a particularly funny sequence, she dresses herself in giant canvas coverings in order to live out a Cinderella fantasy. Keep in mind, she's a giant robot capable of destruction on a global scale. She is given a tragic side by her inability to control her computerized defense systems, which go into overdrive when she's threatened by other orbital frames. She doesn't want to kill and destroy, but she can't help it when confronted with possible injury. I'm convinced this anime is something special. While Idola was morbidly serious to the point of being possibly the most depressing anime I've ever seen, I, Dolores manages to mix up the emotional content so you're not assaulted with any one thing at a time. It's got fantastic writing and it really knows where it's going. The episodes don't feel like filler or tacked-on adventure, and the eternally tragic figure of James Links as a failed but striving, aging father makes for a very compelling central character, as opposed to the usual, angst-ridden, young central heroes who populate most anime. For a series in which the creators knew the audience would expect something action-packed, they managed to deliver without sacrificing a real story and depth. Most impressive. Image Transfer Review: Super crisp and clean are the best adjectives here. The transfer is virtually perfect, despite a few instances of dot-crawl here and there. The color and detail all works together superbly and results in another impressive modern anime transfer from ADV, sure to please virtually any animation fan. Audio Transfer Review: The 2.0 soundtrack is filled with lots of activity and surround action. It's a great audio experience that really fits the clarity of the transfer, as well as the tone of the show itself. Very immersive. Good bass and general soundfield make even the most basic scenes into attention-getters that stand out quite a bit. The English dub is generally serviceable, although I prefer the more expressive Japanese audio, which definitely works better, especially for roles like Dolores. Interviews with director and co-writer. Extras Review: There are two featured interviews, in which the director and one of the writers discuss their ideas and opinions on where Z.O.E. is headed. Both interviews are subtitled, but you might want to pause every now and then to read the text of what question the person has been asked, which is what they're responding to. On top of the normal clean opening and closing tracks, there is also a reel of the original Japanese promotional trailers for I, Dolores episodes, which are referred to as "Dolores' Diary." They're a cute series of commercials in which Dolores tells you what's going on in the next episode in her own view, as if she were writing a daily journal of sorts. There are galleries of completed artwork and cels, as well as conceptual work not fully used in the show. ADV previews wrap up the package, and the presentation is the usual for the series so far, including the colored case, which is now a silvery grey. Zone of the Enders is definitely worth checking out. As it evolves and changes direction here and there, we get a very complete anime with endearing characters and struggle we can really get behind. Like the best heroes, the Links family make an awkward trio to cheer on, but it works very well.